Virtualisation is a mature technology today. Hypervisor like technologies afford the guest OS to be agnostic to the underlying hardware. All hardware access is provided by the Hardware Abstraction Layer. 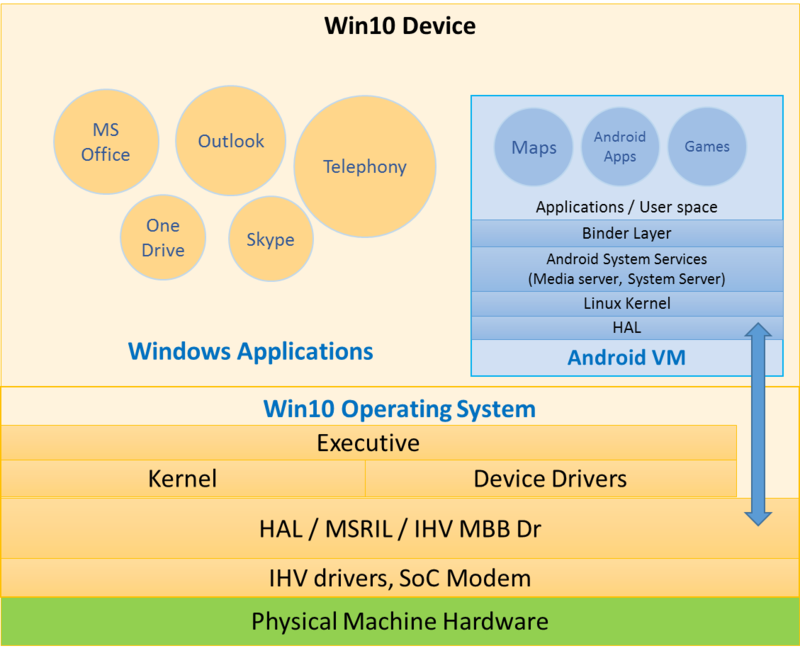 Windows Kernel and Android Kernel follow the same approach – in fact all major operating systems are built with this approach and structure. Virtual machines are available for different operating systems to run on Microsoft Windows. An Android virtual machine running on Windows 10 is curiously missing. Android is an open source OS and there are creative ways of using it to build a fully compatible VM. Building an Android VM is not too far from building a Linux VM; after all, Android is a derivative of Linux. Factory installed AnVM (Android Virtual Machine) on every Win10 mobile device with inbuilt google play app, letting AnVM access all the devices and controls via host Hardware Abstraction Layer (HAL) would be the path ahead. 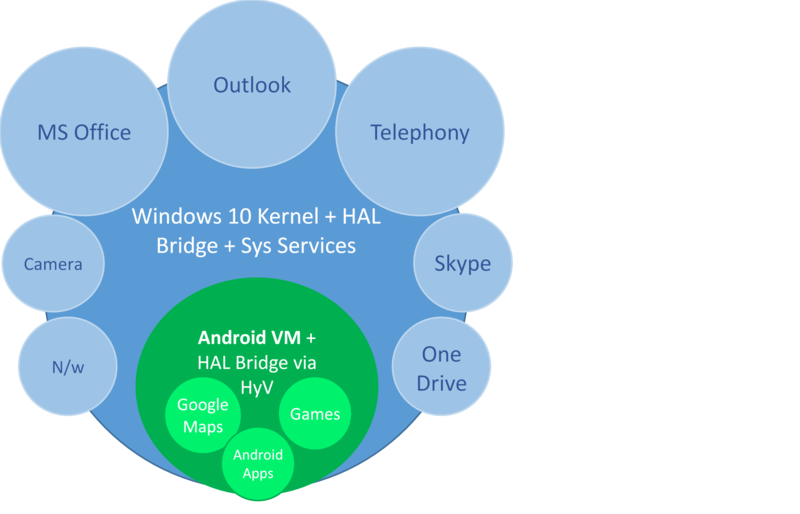 The two Operating Systems (Host Win10 and Guest Android) will need to talk to each other at the HAL by bridging much as the VMs do now. The Win10 registry would recognise all APK files as objects to be delegated and managed by the AnVM and pass the control to AnVM completely. AnVM will assume total control of a process either while installing an APK or when an APK is executed much in the same way as a VM does on a desktop. This may be a game changer for Microsoft and the app builders alike. Acquiring Nokia was a brilliant idea. Unfortunately, taking the market head-on, downplaying the absence of apps ecosystem in a highly evolved user market did not yield business returns. With the VM approach Microsoft could rewrite the chapter. Besides, if Win10 really works seamlessly across devices, android apps could work even on a Windows laptop! And the laptop world still belongs to Microsoft. Even today, people like Nokia Phones for their quality. People want to use Windows phones for the continuation of experience from PC. Microsoft office and Outlook are hard to replace. Certainly for some time in future. However, people hold back from buying Windows phones for lack of apps. Very few serious apps like banking and other are released for Windows even today. Device usage patterns and information consumption devices are rapidly changing. It foretells the future influence competing platforms will have on the directions until a seriously disruptive innovation comes along. Microsoft could still turn the tide in its favour while it has the critical mass to roll.